Wildlife notes 2005 young stoats were seen playing with each other on the banks of the ponds, one nearly paid for the in attention it was paying to the surroundings with its life, as Molly (our springer spaniel) nearly caught it!. The badgers are now rolling down and eating our wheat, I can see why many farmers do not like them as they do make a mess of a standing wheat crop and also maize crops. They have been known to take the maize cobs to the extent that there are few maize cobs left in some fields. SO YOU THINK YOU WORK HARD? The robins started work before 5am and worked all day every day (rain or shine) with out respite until after 10pm and you thought you worked hard!! 15 badgers were seen out together last evening including 6 badger cubs ( 23rd / 24th June), as well as two barn owls and two foxes. 33c yesterday! 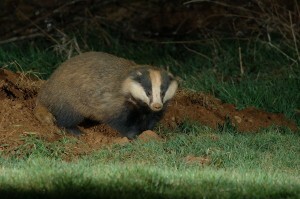 oppressive heat, 14 badgers were seen out of their sett at one time last night. 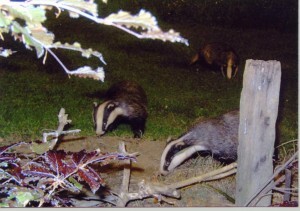 An occasional visit from a barn owl seemed to make little difference to the badgers. The badgers were however quite argumentative with each other (must be the heat) one of the badgers was seen to be limping away with a bite to his foot which was sustained during one of the arguments. The badger cubs seem to have been born at widely different times this year as some are really small and others at least half grown. The smallest cub is around 12 inches in length and stays with its mother most of the time. 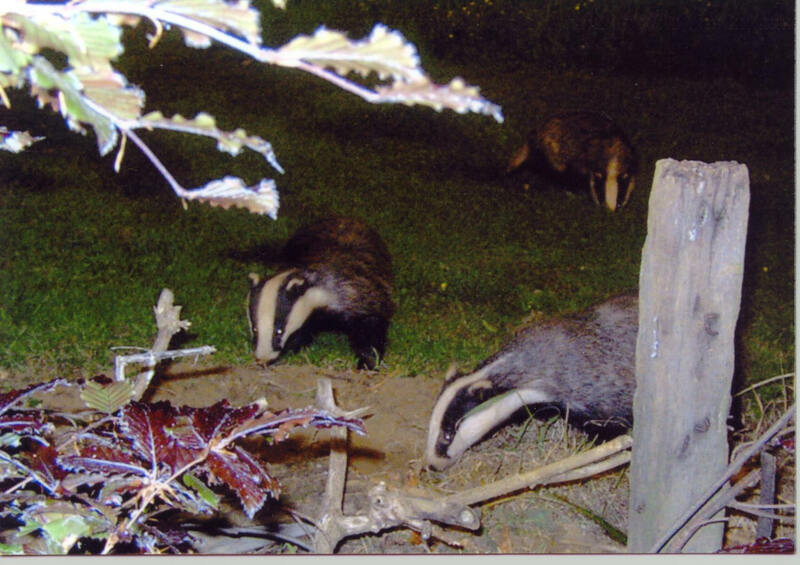 The weather has improved some what and temperature has increased to 9c at night (still cold for May) but we now have 6 badger cubs out playing together. One of the cubs is much smaller than the others but makes up for it by being the most boisterous and coming right up to the aperture in the lower hide looking for the elusive peanuts. 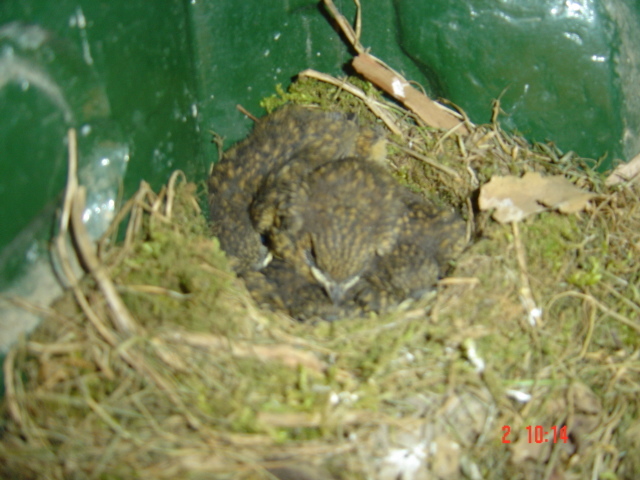 I found an injured little owl (the owl appeared in shock with no outward sign of any damage) on my early morning dog walk (10th May), I put the owl in a cardboard box for the day with the top closed, In the late evening I put the box out in my enclosed garden where the owl would be safe from predators and left the top open. The little owl had flown when I checked the next morning. This is the second time in three years that I have found little owls that have either flown in to an obstruction or been hit by a sparrow hawk. Fortunately for them on both occasions they have recovered. -2 C on the night of 10th May I covered my new potatoes but the frost still caused massive damage through the covers I also noticed frost damage to several ash trees whereby the frost has burned the leaves. Traditionally the young rooks leave their nests 10th -12th May it was a fine evening on May 10th and a massive commotion was heard from the Traitors Ford rookery. and along the valley toward Sibford Gower. The young rooks had taken to their wings albeit shakily and alighted in trees all along the valley. 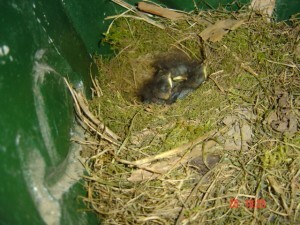 The raucous calls were from anxious parents and lost young ones as one parent tried to out call the next parent. 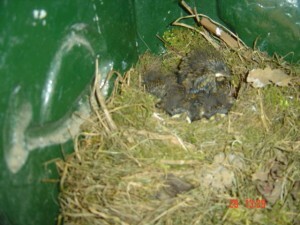 We came back from a weeks holiday to find a robin has built a nest in our post box. A tremendous amount of work and all in 7 days. 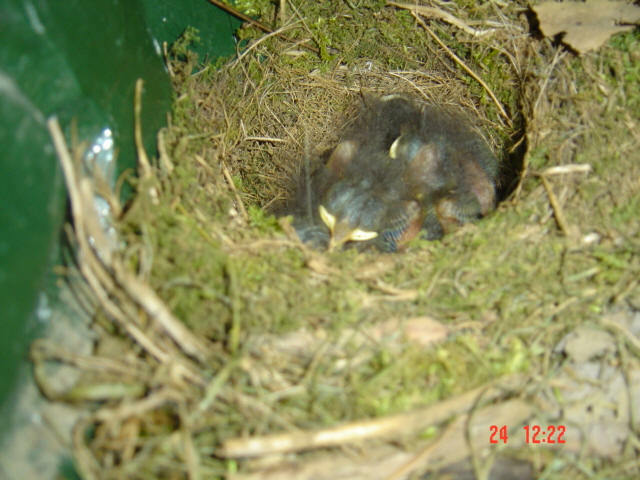 It was extremely fortunate that I had asked the post man to hold all our mail until we returned, I have now had to redirect the mail for three weeks or so as the robin is now sitting on eggs. I will keep our web site updated regularly on the robins progress. Very good badger activity all week with 5 to 7 badgers emerging together, there also appears to be a family of foxes taking up residence in the outer part of the top badger sett!! I (and my three Springer’s) walked past a white fallow deer that was motionless in our wild bird cover at 6-48 am yesterday! The deer knew that I and the dogs were there, the dogs however did not find any scent from the deer even though it was only 5 metres away. I walked quietly by the deer, it did not twitch an ear or blink an eye. The deer was seen again by out current badger watchers this morning along with a much darker deer that blended more successfully into the surroundings. 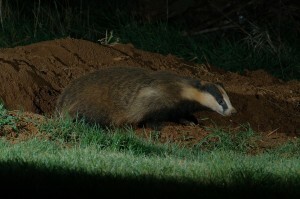 The first badger cub of 2005 was seen out of the sett at about 10 pm on Saturday 26th March by Elsie and Evan. ( current badger watchers) The cub was out of the sett for a about 30 seconds before being ushered back by a concerned mum. The cub was about 6 inches long and totally black and fluffy. (I have never seen a badger cub out of the sett at this time of year) The same evening a barn owl was seen at one of our barn owl boxes. Our badger watchers (last week) heard badger cubs wittering in one of our setts. The cubs were not allowed above ground by their mother, but they must have been close to the sett entrance to have been heard by our watchers sitting in the hide! 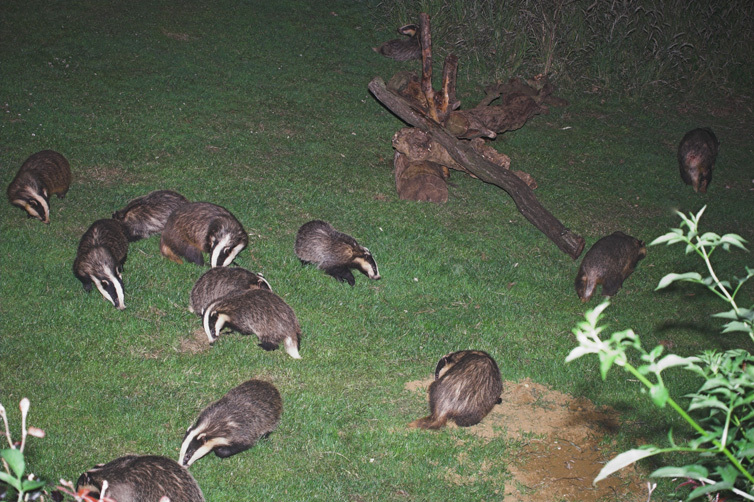 I have received the first 2005 badger photos that were taken last week. Phew what a cold month February was and also the first week of March temperatures down to – 7c with constant snow showers during the day. 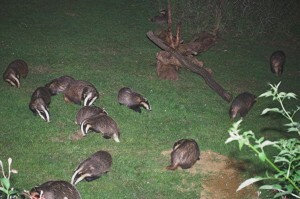 The badger watching has however remained unaffected with 7 badgers being seen out at one time with lots going on. 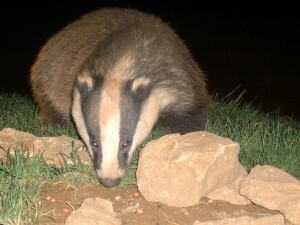 On one evening recently 7 badgers and 7 fallow deer where seen on the same evening. I thought the white stag (that many of us have seen) seemed to be in two places at once. I had received sightings of the stag miles apart on the same day! I had put this down to the stag being very active, but no, far more simple than that there are of course two white stags!! They were both seen at the same time on Friday evening. On my dog walk yesterday mid-afternoon from Whichford (accompanied by Karen & Martin (badger watchers) we were delighted to see two separate herds of fallow deer 4 in one herd and 6 in the other. The white stags were not with either herd. We also saw a hare, heron, pheasant and numerous rabbits not to mention the numerous small birds that seem to be flooding in to breed. We noted the rook population at Traitors Ford getting very busy clearing and tidying up their nests with the odd rook appearing to be sitting on eggs. All of this in one and a quarter hours in the winter/ spring sun, truly a delight to be alive. For the last four days I have been greeted by bird song on my early morning dog walk is spring here? I fear not! I saw a herd of 8 fallow deer gallop through the farm last Sunday (the white stag was still with them) They jumped our hedges one after another a truly spectacular sight, and then on Monday 31st Jan @ 7-30am I was treated to the sight of two Roe deer showing them selves in amongst the young trees within the newly planted wood. The ‘CBF’ badgers are active, with lots of sett digging, bed changing and association going on, I guess that there are now cubs in the sett as some of the badgers seem very nervous and protective. I have just cut all of our grass 2nd February 2005 I do not normally do this until March but if I had left it until then we would have been making hay with it! I have however left it lying on top of the existing grass to encourage slugs for the badgers evening meal. 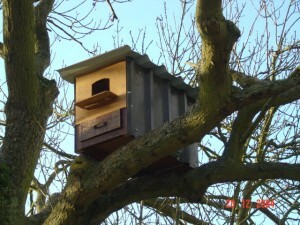 I have now installed two new barn owl boxes and cleaned out the existing box. 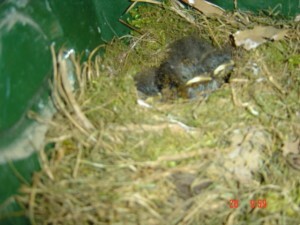 Interestingly enough it had about 40 to 50 large owl pellets in it. The pellets were all made up of tightly knit mouse fur and bones. I found it most rewarding to find the pellets. 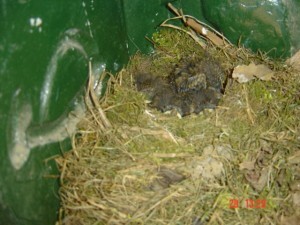 I have seen barn owls around the box but had NO idea that they had been using it that much. Most of the moorhens have disappeared and yesterday I caught up with what I believe to be the culprit. I found a large black mink running around in my grain store. It made a big mistake in arguing with Winston my springer spaniel who promptly shook it by the neck and threw it up in the air. It was dead before it hit the ground. If the people who let these vicious killers out into the countryside could have seen how much damage they have done to the wildlife, I am sure they would have second thoughts about giving them their freedom. I have also seen about six feral polecats here this winter they look similar to the mink and just about as vicious. Our rabbit population has diminished by about 75% due to the predation of the mink and polecats, thereby causing a problem for the buzzards who are finding it much tougher to find food. 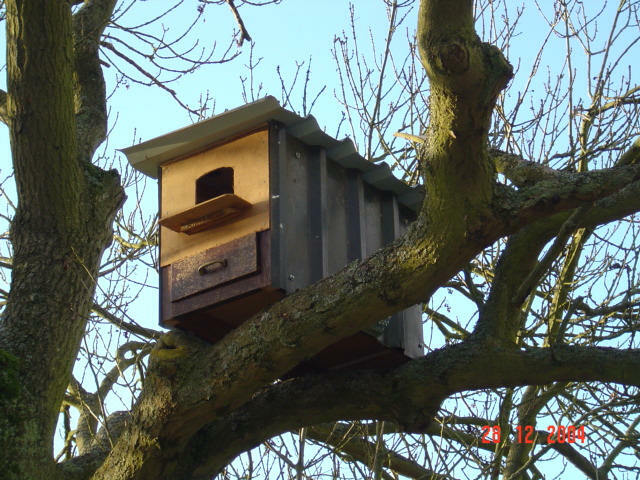 I am grateful to Mark Barnes for the donation of an old office desk from which we made the two owl boxes. The pedestal parts of the desk were just the right size and with a little modification from my two sons were soon turned into owl, boxes. The above photograph was sent to us (December 2004 ) by Mr. & Mrs. Caines December 2004 the photograph was taken from the path way leading down to our lower hide, during May 2004.